The Camden County Prosecutor’s Office and Camden County Police Department are seeking the public’s assistance in identifying a man who robbed a bank today. 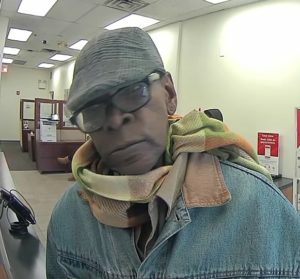 The suspect entered the Bank of America located at 433 Market Street in Camden at approximately 12:10 p.m. and passed a demand note to a teller. He received an undisclosed amount of cash and fled the scene. No weapon was displayed and no one was injured. 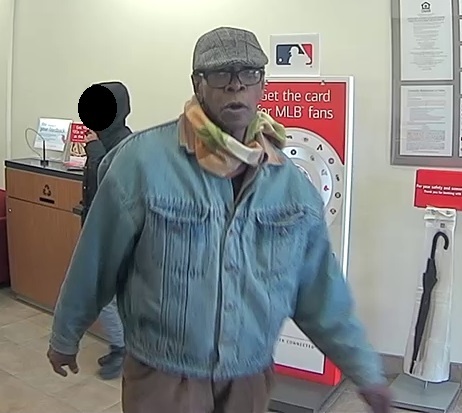 The suspect is described as a black male wearing a flat cap, a multicolor scarf, a jean jacket, khaki pants, and white shoes. The suspect, who may be in his 50s or 60s, was wearing eyeglasses. He was also described as having acne scarring/craters on his face. Anyone with information is urged to contact Camden County Prosecutor’s Office Detective Andy McNeil at (856) 225-8407 or Camden County Police Department Detective Nick Marchiafava at (609) 519-6922. Released, Friday, March 16, 2018.